Recommended Reading: Civil War Heavy Explosive Ordnance: A Guide to Large Artillery Projectiles, Torpedoes, and Mines (Hardcover) (537 pages) (University of North Texas Press). Description: The heavy ordnance is divided into two sections: large smoothbore projectiles, and rifled projectiles. The smoothbore section is subdivided into: shot, shell and case shot; canister; and grape. Rifled projectiles are then subdivided into twenty-seven major types and one miscellaneous group. Continued below. Recommended Reading: TRIUMPH AND DEFEAT: The Vicksburg Campaign [ILLUSTRATED]. Description: Author Terry Winschel, chief historian at Vicksburg National Military Park, weaves a professional lifetime of personal experience and scholarship into this remarkable study. His chapters cover every major aspect of what many consider to have been the decisive military achievement of the war--the capture of "The Gibraltar of the Confederacy." Continued below. How good was General Grant's generalship? Was Confederate Lieutenant General John Pemberton really as inept as we have been led to believe? Which battle of the months-long campaign was decisive and sealed the fate of the city? How did the civilians deal with the lack of food and supplies? What role did cavalry play in this critical campaign? Winschel discusses these issues and many others with articles on General Grant's march through Louisiana, Grierson's Federal cavalry raid, the battles of Port Gibson and Champion Hill, the infantry assault on Vicksburg, siege operations, John Walker's Texas Division, the citizens of Vicksburg, and much more. ABOUT THE AUTHOR: Terrence Winschel is the Chief Historian of Vicksburg National Military Park and the author or editor of several books and dozens of articles on the Civil War. Winschel and family reside in Vicksburg. Recommended Reading: TRIUMPH AND DEFEAT: The Vicksburg Campaign, Volume 2 (Hardcover). Description: The study of the Civil War in the Western Theater is more popular now than ever, and the center of that interest is the months-long Vicksburg Campaign, which is the subject of National Park Historian Terrence J. Winschel's new book Triumph and Defeat: The Vicksburg Campaign, Vol 2. Following the popular success of his earlier book of the same name, Winschel offers ten new chapters of insights into what has been declared by many to have been the most decisive campaign of the Civil War. Designed to appeal to both general readers and serious students, Winschel's essays cover a wide range of topics, including military operations, naval engagements, leading personalities, and even a specific family caught up in the nightmarish 47-day siege that nearly cost them their lives. Continued below. Smoothly written and deeply researched, these fresh chapters offer balanced and comprehensive analysis written with the authority that only someone who has served as Vicksburg's Chief Historian since 1978 can produce. Bolstered by photographs, illustrations, and numerous outstanding original maps, this second volume in the Triumph and Defeat series will stand as a lasting contribution to the study of the Civil War. About the author: Winschel is author of many books, including Triumph and Defeat: The Vicksburg Campaign (1998, 2004), Vicksburg is the Key: The Struggle for the Mississippi River (2003), Vicksburg: Fall of the Confederate Gibraltar (1999), and The Civil War Diary of a Common Soldier (2000). Terry is also a popular speaker on the Civil War Round Table circuit and has made frequent appearances on the History Channel. He lives in Vicksburg, where he works as the battlefield's chief historian. 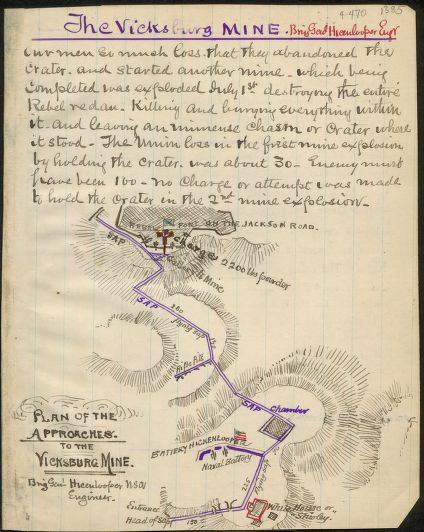 Recommended Reading: Champion Hill: Decisive Battle for Vicksburg. Description: The Battle of Champion Hill was the decisive land engagement of the Vicksburg Campaign. The May 16, 1863, fighting took place just 20 miles east of the river city, where the advance of Gen. Ulysses S. Grant's Federal army attacked Gen. John C. Pemberton's hastily gathered Confederates. Continued below. The bloody fighting seesawed back and forth until superior Union leadership broke apart the Southern line, sending Pemberton's army into headlong retreat. The victory on Mississippi's wooded hills sealed the fate of both Vicksburg and her large field army, propelled Grant into the national spotlight, and earned him the command of the entire U.S. armed forces. Timothy Smith, who holds a Ph.D. from Mississippi State and works as a historian for the National Park Service, has written the definitive account of this long overlooked battle. His vivid prose is grounded upon years of primary research and is rich in analysis, strategic and tactical action, and character development. Champion Hill will become a classic Civil War battle study. Recommended Reading: American Civil War Fortifications (3): The Mississippi and River Forts (Fortress). Description: The Mississippi River played a decisive role in the American Civil War. The Confederate fortifications that controlled the lower Mississippi valley were put to the test in the lengthy Federal campaign of 1862-63. Vicksburg was a fortress city, known as the "Gibraltar of the Confederacy," whose capture is often seen as the key to victory in the war. Continued below. This book explores the fortifications of the river valley, focusing on Vicksburg and its defenses which boasted a network of forts, rifle pits, and cannon embrasures surrounding the city and examining the strengths and weaknesses of the fortifications when under siege. Also examined are numerous other fortified strongholds, including New Orleans, Port Hudson, New Madrid and, forts Henry and Donelson, all lavishly illustrated with full color artwork and cutaways. Recommended Reading: The Beleaguered City: The Vicksburg Campaign, December 1862 - July 1863 (Modern Library) (Hardcover). Description: The companion volume to Stars in Their Courses, this marvelous account of Grant's siege of the Mississippi port of Vicksburg continues Shelby Foote's narrative of the great battles of the Civil War--culled from his massive three-volume history--recounting a campaign which Lincoln called "one of the most brilliant in the world." "Foote delivers another masterpiece... a welcomed addition to every Civil War buff's library."